Cherry blossoms have arrived in Taiwan’s north, bringing festive cheer to the Lunar New Year season. At several spots in the Taipei area, trees are already approaching full bloom. The area near Tianyuan Temple in New Taipei City’s Tamsui District is one such spot. The trees here are the result of the successful grafting of Taiwanese and Japanese species. Their blossoms range from white to pink to deep red, a spread of colors that makes the spot popular with photographers. Meanwhile, the Sunshine Sports Park in New Taipei City’s Xindian District is also filling up with cherry blossoms. The blossoms in this area are expected to last until around early March. However, with the long Lunar New Year holiday set to continue through the end of the week, many people are likely to flock to spots like this for an early look at the blossoms. 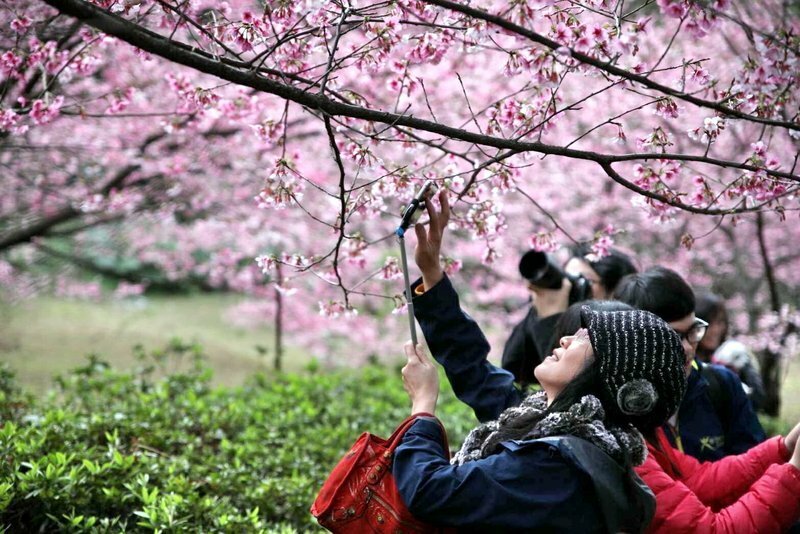 New Taipei City’s metro company is encouraging people to beat traffic by taking public transport to popular blossom viewing sites.